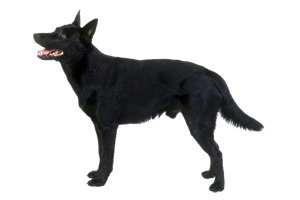 The Australian Kelpie is a herding breed that originated in Australia. They were bred to work with sheep having little or no guidance. Which made them highly prized among farmers and ranchers. It is said that these dogs can cover as much as 30 miles a day, keeping track of thousands of animals. In close quarters Kelpies will run over the backs of sheep when they are huddled together rather than around them. Today they have been imported throughout the world and their charges have expanded to include cattle, goats, ducks, chickens, and other livestock. The name ‘Kelpie’ was given to a black and tan female puppy in the early 1870s, after the Scottish water spirit. It stuck and eventually Australian collies became Australian Kelpies. In Australia there are two types of recognized Kelpies, the Working Kelpie and Show Kelpie. The Show variety, bred for conformation, is more limited in colors and is often heavier. While the Working is bred solely for its ability to herd. The development of the Australian Kelpie begins in the late 1800s when old collies were imported to Australia from Europe for livestock work. These dogs should not be confused with any of today's breeds. ‘Collie’ encompasses a group of dogs similar in type and this was even more true before the invent of kennel clubs. Unable to handle the extreme climate of their new homeland ranchers desired a sturdier dog to work with their sheep. From there the history becomes more muddled. It is generally accepted that the Australian Kelpie’s primary European ancestors were Scottish collies. However, this was before breeding records and any number of breeds and dogs may have been used in their makeup. The native Dingo almost certainly among them. Regardless of how it came to be, the type became fixed and in the early 1870s ‘Kelpie’ was born. Later her daughter carried the same name and eventually it was given to the breed. By the 1900s the Show and Working lines had already begun to split as Ranchers had no desire for their dogs to show in conformation. Today the Australian Kelpie remains somewhat unknown outside its homeland. However it is still highly prized for its working abilities and has more recently been included in the American Kennel Club’s Foundation Stock Service. Is the Australian Kelpie Right for You?